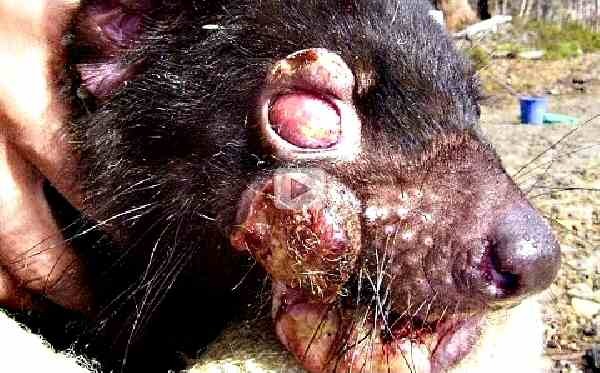 Biological research shows genetic resistance to Tasmanian devil disease. The Tasmanian devil is an animal unique to Australia. It Once resided all over the continent. Perhaps is was easy for Aboriginals to catch for food. It cannot run very fast. It could just have died out due to a warming of the country. Tasmania is its only natural home today. Their raucous cries led to them being named devils by European settlers. They are violent to each other though attacks on humans are virtually non-existent. Scavenging for food is their number one priority. A facial disease began in the species in 1996. It was unusual in that it is the only known cancer transmitted from animal to animal. Tasmanian devil numbers fell by 80 per cent in twenty years due to Tasmanian devil facial tumor disease (DFTD). Extinction was predicted. However, it was noticed that some animals survived without getting the disease. Genes were examined and these devils had five genes not present in their brothers who succumbed. This shows that all animals currently living are unlike their ancestors who dominated even a hundred years ago.